--- Das Pew Research Center, das regelmäßig die Medien- und Onlinegewohnheiten der Amerikaner untersucht und nach dem Irak-Krieg etwa herausgefunden hat, dass sich 4 Prozent der vernetzten US-Bürger im März 2003 dezidiert aus Weblogs über den Kriegsverlauf informierten, hat eine neue Studie herausgegeben. 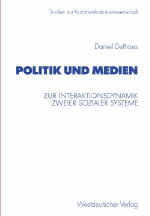 Darin wird deutlich, dass das Netz als Informationsmedium im Präsidentschaftswahlkampf weiter Boden gewinnen konnte: the relative gains for the Internet are especially notable. While 13% of Americans regularly learn something about the election from the Internet, up from 9% at this point in the 2000 campaign, another 20% say they sometimes get campaign news from the Internet (up from 15%). The survey shows that young people, in particular, are turning away from traditional media sources for information about the campaign. Just 23% of Americans age 18-29 say they regularly learn something about the election from the nightly network news, down from 39% in 2000. ... At this stage, the Internet remains a secondary source – even among Internet users. About three-quarters of Americans who use the Internet (76%) say television is their first or second main source for news about the campaign (37% cite newspapers, 20% the Internet). Still, the number of Americans overall who mention the Internet as a main source – as first or second mentions – has nearly doubled since 2000 (from 7% to 13%). Führend sind im Netz aber weiter die "großen Medienangebote": Among Americans who use the Internet, 40% say they regularly or sometimes learn about the campaign from the news pages of web portals like AOL and Yahoo.com, and 38% say the same about web sites of major news organizations like CNN and the New York Times. Just 11% regularly or sometimes learn about the campaign from online news magazines and opinion sites such as Slate.com.